One of the questions I often get asked is “how do I get to (insert destination here)?” I reply with the route I took, following it up with the other possible routes that they can take. A related question would be “what airline did you take,” and “how much does the flight cost?” It gets tiring after a while, since for me, it’s something that you can easily search for in Google. Apparently, there’s an even easier way to search for flights: Skyscanner. It’s basically a travel search site that helps you find cheap flights and even the ever elusive promo fares that airlines offer. 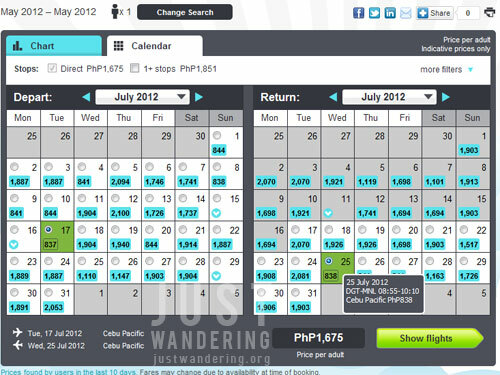 Here’s what you do, go to www.skyscanner.com.ph. Since it’s a localized version of the main site, the site will be in Tagalog and the currency defaults to Philippine peso. You can change this by clicking on the language option at the top of the page. Fantastic feature for those who can’t set a date. Like me. You’re probably already used to the booking facilities of most airlines: select origin airport, destination airport, departure and return dates, etc. 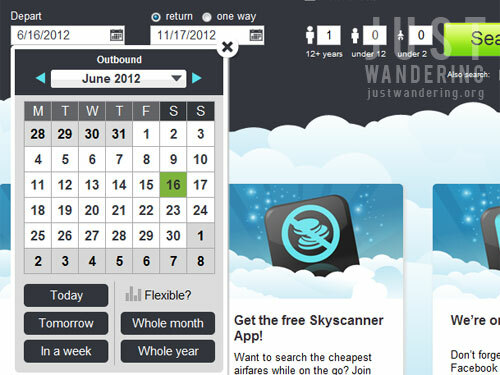 Skyscanner looks the same, but with one huge difference: you don’t have to set a destination nor a date for your search! Actually, you do. At the start, you just set your home airport and set an open date for your trip. You can set it to search for flights tomorrow, next week, the entire month or even the entire week. Leave the destination set to everywhere and Skyscanner will show you a list of destinations you can go to, starting from the cheapest fares. So much easier to find cheap airfare! The great thing about this is that if you want to travel, but can’t make up your mind where to go, this gives you concrete ideas as to where you can go based on your budget and schedule. One awesome feature that I liked is the fare chart that shows you which days are the best to travel so you’re guaranteed cheap airfare. Skyscanner searched through thousands of airlines, so gone are the days where you have to open at least 3 browser tabs just to check fares and schedules for different airlines. How’s that for convenient? Speaking of convenient, they have a mobile app for your iOS and Android devices. Of course, it requires a network connection, but it does make searching for flights while you’re on the go so much easier. Skyscanner is not a booking site. While it does the searching for you, to book the flights you selected, you will be redirected to the airline’s website. Worry not though, because when you’re redirected, you’ll find yourself in the flight selection page, with the destination and dates already set to the specification you set in the Skyscanner website. Nifty, eh? 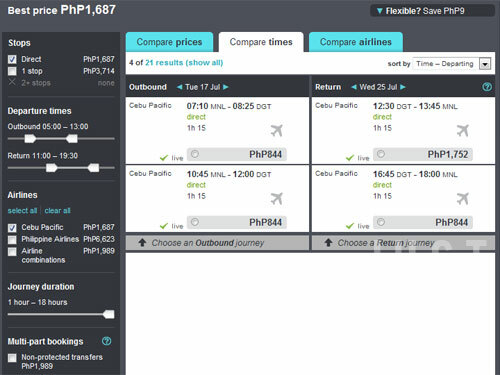 When I was redirected to Cebu Pacific’s website, the cheapest fare is actually Php488. Oddly enough, the total still ended up more expensive than the rate quoted in here. By the way, if you’re planning a trip with friends and family, you can share your search results to the joiners through Facebook, Twitter, or e-mail. 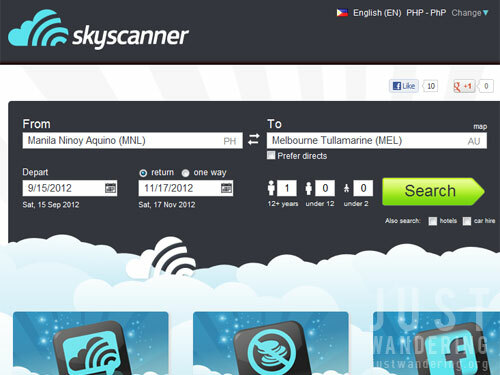 Give Skyscanner a try, it’s a really impressive and easy to use travel tool. The unfortunate downside that I ran into while trying it out is that it’s making me want to book a trip. Or three. wow this is so cool! thank you! That’s a useful share, i am from Malaysia traveling around Asia and found this site called Fleapy http://fleapy.com to be pretty useful too. Like Skyscanner but focuses more on AirAsia. This is such good information! There are so many times when I have a destination in mind but am flexible on dates–this seems like the perfect way to find the cheapest fare! Thanks for sharing! Thanks for this. Helpful indeed. Love your blog. Now that is definitely a very helpful tool, especially since I travel a lot and am always on the lookout for cheap airline tickets, I usually go through every airline site I know and compare the rates, this tool will help to cut down my search time! Actually, even if this an advertorial, I liked the fact that you featured Skyscanner. 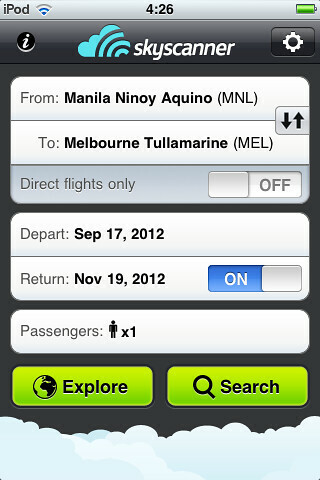 I bought an app for flights and it didn’t live up to Skyscanner’s features– what more with other free apps. This is my go-to site whenever I plan for travels. It really provides the best rates! I’m still exploring Skyscanner so I’m not sure if this is an available feature but hopefully, they can compare different prices & amenities of flight classes. We travel a lot and sometimes, we wanna splurge a little on flights + hotels so maybe, that’s a good feature they can phase in the future. By the way, you have a cool blog! I read it before I go on trips, alongside other travel sites & blogs. But yours is very insightful. I hope you feature more trips w/o Visa requirement (for Philippine Passport holders). There are a lot, right? Can’t wait for your future posts! Thanks Wence! Unfortunately, I’ve exhausted all visa-free countries in Southeast Asia. Aiming to go farther now, but that’s taking a while because it gets more expensive! Agree with you about the flight class thing — from what I’ve seen so far, it seems like it defaults to economy class. That’s a very helpful tool, and definitely a must-have for any frequent traveler. WOW! halos no brainer na ito ah! ang dali, dali, dali lang! haha! Thanks for this Nina!